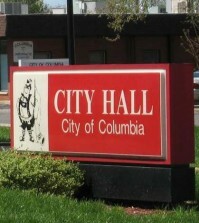 Excitement abounds at the Main Street Abbey development, which involves significant renovations to the former Immaculate Conception Catholic Parish property in downtown Columbia. Developer Gregg Crawford has put years of planning into turning the grounds into an epicenter for economic growth. With the completion of a café and hair salon in the former church convent, that planning is paying off. Pictured is owner Marcia Brooks inside her coffee shop Café on the Abbey. But an even bigger part of the project is the event space in the former church building known as The Abbey, and it’s nearing completion. To add another layer of excitement, the same Columbia man behind a hugely successful nonprofit organization supporting combat veterans will serve as the venue manager of the space. Songs4Soldiers founder Dustin Row of Columbia said he is thrilled to have this opportunity and is even putting in extra hours to ensure the project comes together in time. “I’m here on weekends, but it doesn’t even phase me because I love it so much,” he explained. As of now, Row is pushing for the hall — which can seat up to 220 people — to be completed at the end of the month. He said he would like to celebrate the finished product with a grand opening in June. However, that hasn’t stopped Row from booking a total of about 20 events, most of which are weddings, as work continues to progress. Row also said the venue has had a lot of success drawing in clients from across the river. Getting people to take notice of the new venue has required a lot of work. For instance, Row said he had to start with little more than a concept when Crawford hired him. “I basically told Gregg that if he wanted to make this happen in the spring, we would have to start from scratch,” he recalled. From there, Row worked on creating items such as a logo and Facebook page for the Main Street Abbey development. Row has also been diligent in executing his vision for the look and feel of the venue. Among his ideas for the project, Row is repurposing a number of items left by the parish. Immaculate Conception Pastor Fr. Carl Scherrer’s dresser will serve as the backdrop of the venue’s bar with wine and craft beer taps. The church organ will remain where it is with LED lights added inside the pipes, and the stained glass windows the parish didn’t take to the new church will remain intact. For weddings, the room to the left of the altar will serve as the groom hangout with a fridge full of beer and a TV. The bridal suite on the other side of the altar will include amenities such as a bathroom and couches. Spaces at the entrance to the hall are being renovated into a caterer’s kitchen, coat check and bathrooms. “Instead of what you see traditionally, each stall is going to look like a mini confessional,” Row said of the bathrooms. Renovations also include add-ons, such as a PA system with speakers on the walls around the room. Row explained the system will be designed so the sound travels directly to the guests rather than bouncin off the high ceilings. Outside of the hall, work is being done to install a courtyard for wedding guests to enjoy a cocktail hour while the staff flips the venue between the ceremony and the reception. The 40-foot-by-40-foot courtyard will be partly artificial grass and partly concrete with tables and chairs and a bar. Plenty of parking will be available for those using the venue, including in the lot across from the church and spaces between the playground and school. More parking will be available when the school moves to its new location. Aside from weddings, the venue can host showers, birthday celebrations, holiday parties, anniversaries, live music events and more. Contact Row at 618-612-7206 or at dustin@mainstreetabbey.com to book an event. For more information, go to mainstreetabbey.com. “The wedding industry force feeds product,” Row explained. “You have the older people — like the aunts and uncles — who normally stay in on the weekends. Also excited to be a part of the Main Street Abbey development, Marcia Brooks opened her new Café on the Abbey in February inside the former church convent. “This is a pretty exciting development and we’re excited to be a part of it,” Brooks explained. 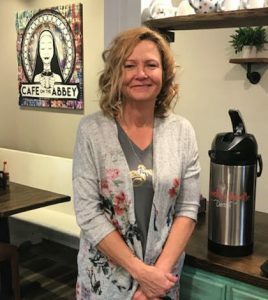 Brooks said her cafe, which was formerly known as Our Coffee House and Café and was located on Rapp Street, has enjoyed a lot of success in the new space. Along with the new space, restaurant chef Danny Ball has signed on to be a partner in the business. Ball has 40 years of restaurant experience and has been a top chef at a few highly rated restaurants. “Our food is awesome now but it’s about to get even better,” Brooks boasted. The address for the new location is 322 S. Main Street. Hours of operation are 6 a.m. to 4 p.m. Monday through Friday, as well as 8 a.m. to 2 p.m. Saturday and Sunday. 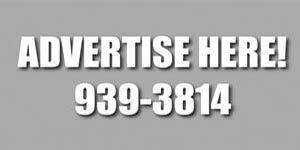 Contact the shop at 281-4554. Colour Bar Hair Studio owner Liz Upchurch has also moved her business into the convent. 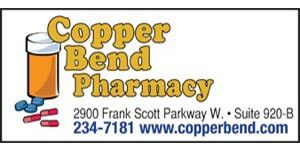 She is now located at 320 S. Main Street, and can be reached at 618-409-6169. In addition to the hair studio and cafe, the convent will house a total of three lofts. 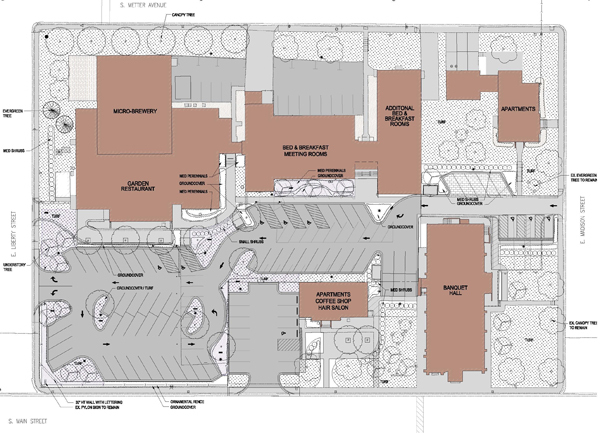 Crawford plans to include an additional five lofts in the former rectory. Further down the line, work will begin on a microbrewery, restaurant, bed and breakfast, meeting rooms and a theater in the former Immaculate Conception Catholic School.